Fusion Pro ™ is a 24/7 protein matrix for anyone who wants to add proteins to his diet. It consists of an ideal blend of 50% protein whey for rapid absorption and protein synthesis and 50% casein for slow absorption and moderate release of amino acids. 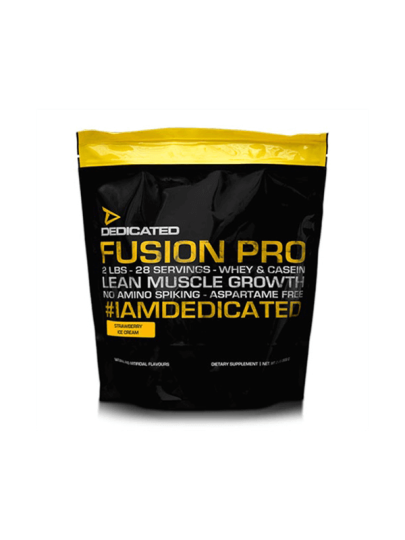 Fusion Pro ™ is a unique protein blend and an ideal ratio for anyone looking to build and maintain muscle mass. Careful selection and processing of cow's milk Fusion Pro ™ contains a unique level of factors that affect immune enhancement and promote muscle growth. Mix 1 round in 250-350 ml of water. Take 1-4 servings during the day. Recommended use on training days: As for days without training (above), but with 1-2 portions immediately after the end of the training. Fusion Pro ™ 50/50 blend consisting of 80% milk protein concentrate and whey protein concentrate 80%, refined fractional palm oil, thickener (xanthan gum), lecithin, flavorings, sweeteners (sucralose, fructose, acesulfame).